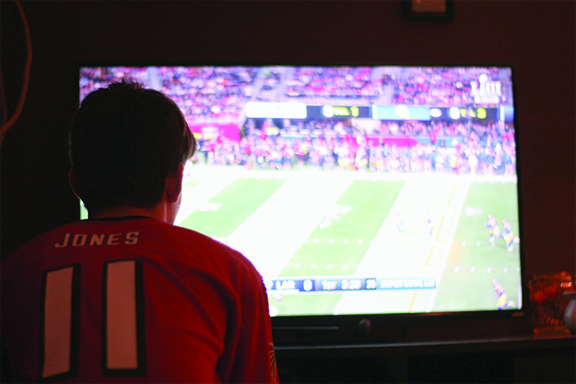 An avid football fan watching the Superbowl. Superbowl LIII was not exactly what fans expected this year. Not only was it the lowest scoring superbowl, but the New England Patriots came on top with tons of doubt from fans beforehand. The Los Angeles Rams had young talent to feature and put to the test with #16 quarterback Jared Goff. This was going to set the Patriots’ dynasty up higher than before and have everyone question if quarterback #12 Tom Brady is actually going to retire or not. In the first quarter, wide receiver #84 Cordarrelle Patterson ran the first play of the game (a completed 38 yards). Soon after, linebacker #58 Cory Littleton had intercepted the ball, giving the Rams a chance at scoring early in the game. Throughout the entire game, wide receiver #11 Julian Edelman made incredible catches that progressed the Patriots further towards success in the game. There was a penalty call on linebacker #56 Dante Fowler Jr. (Rams) for a helmet to helmet that pushed the Rams back. #11 Edelman made a groundbreaking catch with one minute and 50 seconds left in the quarter soon after. With no sacks recorded in the postseason up until the superbowl for Brady, Patriots’ defense impressed many up until the first quarter where that all changed. The end of the quarter had a score of 0-0. The second quarter started with the Rams at their own 11 yard line. At this point, it began to be the game of punting. Punter #6 Johnny Hekker punted for the Rams with no catch afterwards. He ultimately broke the the superbowl record with a 65-yard punt, . Ten minutes were left in the second quarter and tight end #87 Rob Gronkowski began limping, and with being a significant player for the Patriots’ offense, this was a big concern. Placekicker #3 Stephen Gostkowski finally put numbers on the board, with the score now being 3-0, Patriots in the lead. Defensive tackle #99 Aaron Donald, a significant player throughout the game and defensive player of the year, made groundbreaking tackles in the game. Linebacker #53 Kyle Vannoy had sacked #16 Goff. The third quarter had soon progressed to a potential interception by linebacker #54 Dont’a Hightower. Patriot’s safety #25 Patrick Chung had soon after injured his arm with 14 minutes on the clock. Cornerback #22 Marcus Peters made a groundbreaking block on the Rams. Afterwards, there was a completed kick by the Rams and the score tied 3-3. With a tie and only the fourth quarter left, it could go either way for both teams. There was a complete pass to the Ram’s wide reciever #12 Brandin Cooks on the 44 yard-line. Quarterback Goff cut his hand during the game that could have affected his performance. Then, there was a complete pass to #87 Gronkowski at the 51 yardline. With that pass to Gronkowski, running back and rookie #26 Sony Michel had made the first touchdown for not only the Patriots but superbowl LIII itself. Later on, there was a 41 yard attempt by #3 Gostkowski for the Patriots, which made the final score 13-3. With the results at the end, #11 Edelman on the Patriots was made the most valuable player of the game.